According to the Oxford Mail, villagers in Horspath are strongly against a wind turbine being erected nearby. In my opinion, what a shame. If anything, it should give them a sneaking advantage. Human senses quickly become habituated to regular stimuli, so the home team wouldn’t even notice it, while visiting players might find it draws their attention for a few minutes at the start of the game (assuming they are not concentrating on inconsequential matters like bat and ball). Another objection was that the council only backed the scheme for the money. 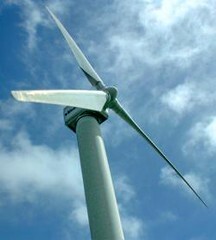 Perhaps we could have a new turbine gracing Bury Knowle Park instead. At one fell swoop, it would demonstrate to those visiting Oxford via London Road that the city is committed to sustainable energy and go some way to supporting the continued existence of the local library. If Horspath villagers are determined to be NIMBY, perhaps somewhere else locally can benefit.